The Conservatory of Recording Arts and Sciences hosts clinic to train students on LEOPARD Compact Linear Line Arrays. The Conservatory of Recording Arts & Sciences (CRAS) recently hosted Meyer Sound and renowned live sound engineer Buford Jones for a clinic for the school’s students at its Gilbert, Ariz. campus. For more than 35 years, Jones rode the wave as the touring sound industry grew from home-brewed loudspeakers and consoles to the huge, manufactured systems that fill stadiums today. Jones’s career in sound reinforcement was established during his nine-year tenure at Showco. In 2001, Jones joined Meyer Sound and contributes to the company in a variety of ways, including advising on product development, bringing the company’s products to the attention of today’s touring engineers, and teaching the next generation of sound reinforcement engineers. 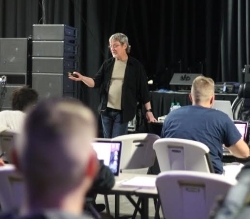 Jones and additional Meyer Sound personnel, including Education Programs manager Gavin Canaan, featured Meyer’s new LEOPARD linear sound reinforcement system during the mix clinic on April 2 in CRAS’ live sound training event room. A truly multipurpose system, LEOPARD is ideally suited to everything from mid-sized touring and live theatre to worship and live performance installations, and from symphony music to heavy metal, making it the perfect system to train the next generation of live sound engineers on. The Conservatory of Recording Arts & Sciences is composed of two nearby campuses in Gilbert and Tempe, Ariz. A CRAS education includes live sound, broadcast audio, film and TV audio, music, and video game audio, all taught by instructors who have all excelled in their individual fields, including sound reinforcement, audio recording and production, digital recording, troubleshooting/maintenance, and music business.